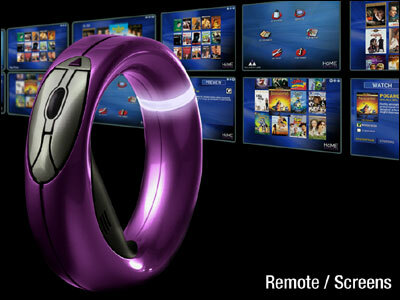 The Loop, A Remote Control Ring | OhGizmo! Who wants to move screens around like Tom Cruise did in Minority Report? Well, Hillcrest Labs has brought us one step closer with their Remote Control Ring. Being released some time early next year, the LOOP will make us the couchiest of the couch potatoes. It uses motion sensing technology to allow you to use hand gestures to scroll and navigate through TV menus, in a more natural “point-and-click” system. Apparently this company has licensed out its software to other companies suggesting big shots like Nintendo and Panasonic are incorporating it in their upcoming products (Wii remote?). Of course, we’re not too sure just what was so terribly wrong with regular remotes in the first place and this could be a high tech case of re-inventing the wheel. Pricing and availability have not been announced.